Summer is just around the corner. If you are planning on having your roof repaired or replaced this summer, it’s important you do your research and choose a reputable and experienced roofing contractor. How do you do this? Simple: you call the professional roofers at Tim Leeper Roofing — 615-553-2782. They’ll listen to your needs, inspect your commercial or residential roof, and then complete the job quickly while also ensuring absolute quality. But, what if you’re not in the Nashville area? How do you find a solid roofing contractor then? This is a good question and to help you get started, in today’s blog post, we are going to share with you five things you should avoid when looking for a roofing contractor. Also, remember that not many legitimate, established roofing companies will go around door-to-door soliciting roofing services. This is a tactic used primarily by “fly-by-night” contractors who make a living out of swindling and then disappearing. Most professional roofing contractors have a physical address out of which they operate. Most roofing jobs and services are completed without incident. However, if something goes wrong — whether it’s damage caused to your home or an injured roofing contractor — it’s important that you, the homeowner, are not held liable. This is why reputable residential and commercial roofing companies will be insured and offer general liability and workers’ compensation. Before hiring a roofing company, be sure to check their credentials and only hire a licensed and qualified roofer. Professional roofers work on roofs day in and day out. This experience affords them an ability to provide estimates with fairly accurate precision. While there may be some circumstances where some flexibility and ambiguity may be necessary, for the most part, you should be wary of any roofer who can’t give a fixed, written estimate. 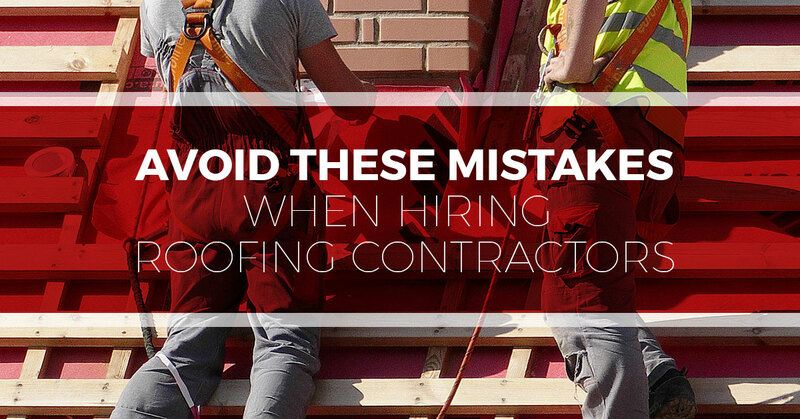 Also, be wary of any roofing contractor who prefers to be paid under the table and refuses to sign a contract. When choosing a roofing company, first get all the necessary details of your roofing services, including materials, labor, and a cost breakdown, in writing. This will not only ensure your investment, but it will also allow you to easily compare quotes from other roofing contractors, helping you get the best fit and bang for your buck. Good roofers stand by their work. Whether you are getting roof repairs or a total roof replacement, these roofing services are expensive. As a homeowner, it is important to protect your investment by securing warranties on the work you are paying for. Reputable roofing companies will offer these warranties as a standard part of their services. In addition to any manufacturer’s warranty, your chosen roofing company should provide a workmanship warranty on the services they perform. The old saying, “You get what you pay for,” proves to be true more often than not. As far as roofing services go, it almost certainly seems to ring true. For this reason, it’s wise to not base your decision solely on the price of the job. Although you should absolutely seek out various quotes and compare them against each other, don’t automatically go with the cheapest estimate. Rather, your decision should be focused more on the quality of workmanship the roofing contractor can provide — a decision you will come to after carefully considering all the previously mentioned tips. Keep these tips in mind when looking for a reputable roofer this summer. If you are in the Nashville area and your home or business is in need of roof repairs or a replacement, we’d love to help you out. Give our roofers a call today at 615-553-2782 to schedule your roof inspection or to get your free, speedy quote.